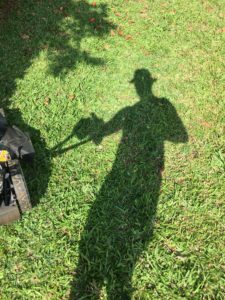 Since this is a website called “Your Dad’s Blog,” it’s high time I talked about the most essential, stereotypically dad thing there is to talk about: cutting the grass. Hold onto your butts, because we’re gonna get into some Lawnmowing Theory today. 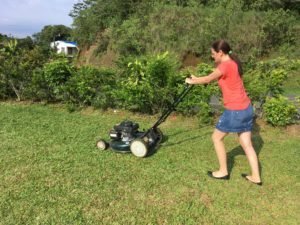 My beautiful wife Angela takes a 10-second spin with the mower. She had never actually tried using it, and I wanted a picture with someone better looking than me so that you might actually keep reading this post. Her assessment of mowing the grass? “No, no. No me gusta. No me gusta.” Eight words, half of which were “no.” It looks like I’ll have to keep cutting the grass for the time being. When I was a kid, I had to mow the lawns at my parents’ house and also at my dad’s work. I did that for most of my junior high and high school years. It was about two hours a week, and it helped me get a bit of cash. However, there were also snakes. Sure, they were “just” garter snakes, but they still scared the crap out of me when they’d dart across the lawn. Eventually, I had recurring nightmares that the whole lawn eventually became covered in snakes. But that’s a story for another post. 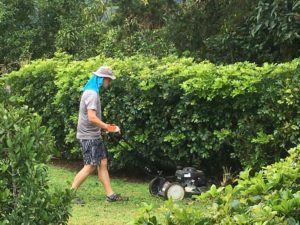 I only bring it up now to show that I have a bit of experience cutting the grass, but it’s not always been a positive experience. 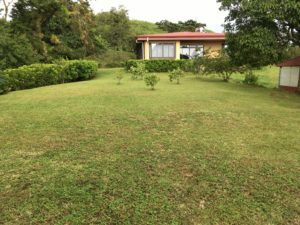 After I moved to Costa Rica and we built our house, we also had some sod planted in the front and side of the house. The rest of the relatively large, flattish yard eventually filled in with was what’s called “monte” here. That’s sort of a combination of weeds, grass, and whatever other small, green plants decide to spring up in one’s yard. 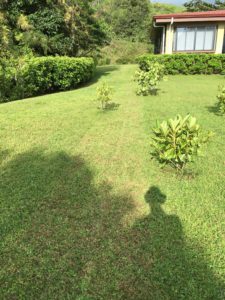 For several years, I used an old-school reel mower that I literally brought down to Costa Rica (it came in a box and I just checked it in on the plane). It worked OK, but once the grass got to a certain height, it would just fold the grass over without cutting it. For several other years, my brother-in-law came over once a month with a weed whacker and cut the entire yard with the weed whacker. I know, it sounded a bit crazy to me, too, but it’s what almost all households here in Costa Rica do, and at least it’s faster than using a machete (which really is a viable option here). But then I finally bought a gas-powered mower about two years ago. It revolutionized our lawnmowing, giving me the ability to quickly and easily cut it myself in about two hours. Still, there was one remaining, nagging issue: grass clippings. I never wanted to use the bag that came with the mower since I usually had to hassle with that when I was a kid, and I hated it. I don’t particularly like seeing dry grass clippings on my lawn, but when I remember that the alternative is schlepping a 20 or so bags of grass to dump somewhere else in the yard, leaving the dead clippings doesn’t sound so bad, after all. There’s also mulching, but with the monte and the quick-growing grass we have, it’s usually too thick to be a realistic option. Yes, gentle reader, I’ve found that better way. Apparently my shadow looks like Heisenberg in parachute pants when I wear my yardwork hat. (By the way, this post title is a shout-out to the great David Rees). This is pretty standard. Well, at least I think it’s standard! Have you ever had one of those thoughts like, “I wonder if I’m the only one who does it this way?” Like, what if blue looks different to everyone else? Anyhow, just cut two loops around the edge of your yard. That’ll give you space to turn around. Alright, I realize that there’s not a lot of contrast to work with in these pictures, but Costa Rica’s a green place! You can probably see the line I’ve cut through the middle of our backyard, though. This will feel super weird and probably go against every fiber of your dad being. But just do it. You’ll be rewarded imminently. 3. At the end of the first row, turn left and then go back to your starting point, cutting the next row. Here you can see how I’m moving outwards from the center, row by row, always throwing the grass clippings to the uncut areas on to the right. Assuming you have a right-side discharge mower, this will throw the clippings onto the uncut grass on the right. 4. When you reach the end of the row, turn left again. Move to the other side of the first original cut, and cut a new row. Repeat, moving from the center row outwards. You can probably notice the pattern here. The grass on your left (i.e., the center) will be cut, and the grass on your right uncut. The clippings will continually get thrown to the right onto the uncut grass every time you make a pass. 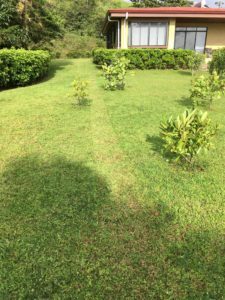 I know that I used to use a circular method, wherein I started on the sides and gradually made ever-narrowing circles until I reached the center of the yard. This is more or less the opposite of that tightening spiral approach. 5. 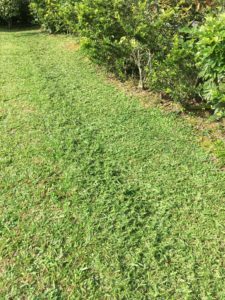 Once you reach the edges of the yard, make one or two passes to throw the last of the clippings to the side of your yard. Here’s the last remaining row to be cut, with the already-cut edges to the right. I cut the row and then did a second pass to throw all the remaining clippings into the bushes. Out of sight, out of mind! This is one step where you may need to change things up, depending on your yard. Ours is bordered by bushes and drop-offs, so it doesn’t really matter if grass gets thrown into those places. But if you have a wall, some flower beds, or something else like that, you may not want a bunch of grass clippings getting thrown onto them. If that’s the case, you may even need to break down and rake up the final row’s worth of clippings. But on the whole, it’s still much nicer than raking the entire yard, isn’t it? This is the monte in our backyard, post-cutting. Sure, it’s not beautiful, and it’s not like you’ll want to roll around in it, but you’ll notice the distinct lack of grass clippings. Mission accomplished! 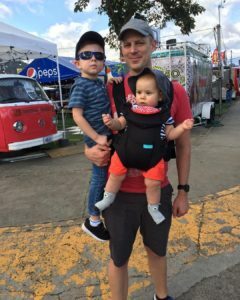 I realize that I’m hitting you with some serious dadditude right now, so I understand if you need a few minutes to process all of this. Sit down, have a drink, and rest a spell. You’ve earned it. But if you have any questions, comments, or even suggestions on how I can improve my lawnmowing technique even more, I’m all ears. Thanks for reading, and happy mowing! Enjoyed this piece of writing a lot, really! So useful to know spiral-cutting is not the better way to go since that is what I used to do. Your grasscutting brilliance does not look that hard to caught up to, so I will take your advice and start with those 2 lines on the borders and then from the middle on. Great post! Thanks for the reply! Long time, no see. How have you been? Thanks again, and hope to hear from you again soon! Yep long time no see, I’m glad to see you are posting often even after taking care of your family which surely drains your time but it should feel like the best time ever. Having kids is something I have planned on doing in 10-15+ years, just like you did. Back when I was studying at Miami I used to spiral cut the lawn at the place I lived at, but I did not bag it. 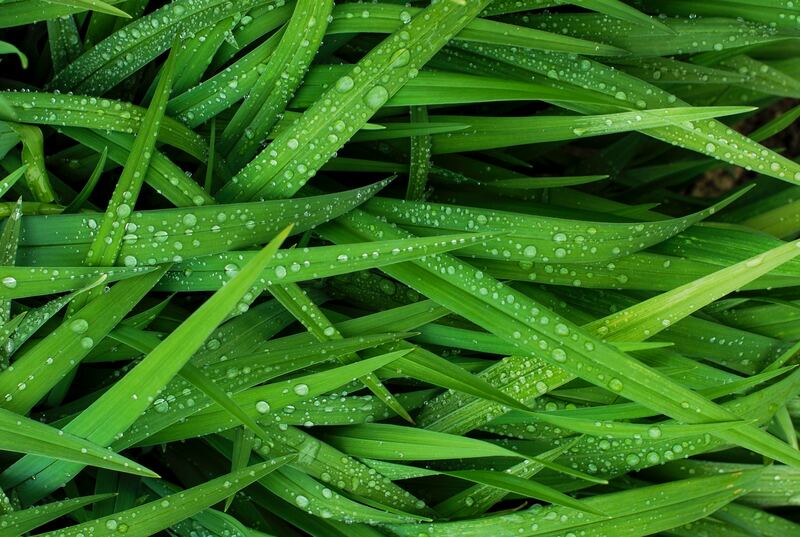 I would rather let the climate do its work and let it decompose, so your technique is one I would surely try if I ever go back to mowing lawns. Let’s go side-discharge! And as for lawnmowing, you can also just leave the clippings on the lawn. I also used to do that, but every time I’d walk through the grass, I’d get a bunch of crap on my shoes and it was pretty annoying. So that’s why I’ve fully embraced my new technique. Thanks for the comment, Annie! I’m glad you’re enjoying the new blog. I’ve been really busy the second half of this year but I’m hoping to get back to writing more soon. As for monte, that sounds like a good approach to take with uptight neighbors! Just be careful because if they speak Spanish, “monte” can also be slang for weed (marijuana…not the other kind of weeds that infest our monte, haha)! Have a nice Christmas and new year!